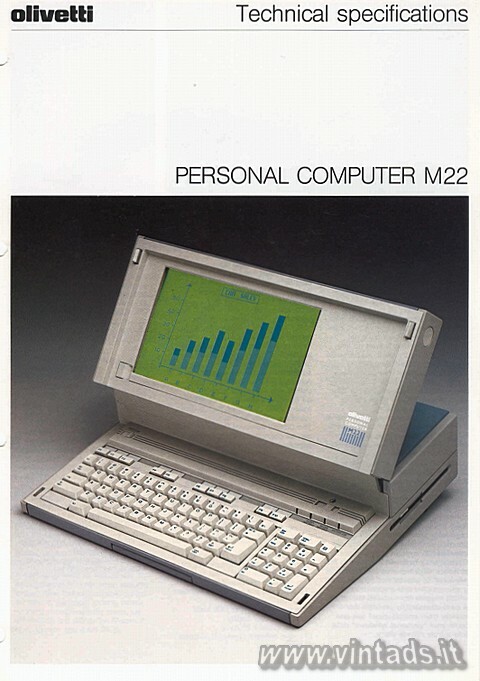 The Olivetti Personal Computer M22 is the ultimate solution in the field of portable/transportable personal Computers. The M22 features an ideal slim design, truly light weight, a full 25-row by 80-column liquid crystal display with backlight technology for perfect vision at any angle and an 85-key professional keyboard in your national language version. The M22 may be operated with either battery or mains power. The system's total compatibility with industry standards ensures that jobs running on the Olivetti Personal Computer M22 may be run on any Olivetti or industry standard personal computer. This full compatibility with industry standards also guarantees access to a wide range of operating systems and languages in your own national version and to an almost limitless software library. With RAM memory configurable up to 1 M byte, with its silicon disk (created in a partition of the RAM and emulating perfectly the characteristics of a floppy disk while being much faster and safer), with its minifloppy disk and integrated 10 M byte HDU, the Olivetti Personal Computer M22 guarantees the same performance as any desk-top model. The built-in "personal windows" software, featuring such functions as word processing, calendar and calculator provides the additional benefits of diskless processing and user-friendly system configuration. Concurrency between the various PC software environments and "personal windows" is guaranteed by means of a second CPU and a special key which toggles from one to the other. A password facility protects the system from unauthorized use and turns your "personal windows" data into a truly private diary. The flexible configurability of this Olivetti Personal Computer makes it easy to transform a portable, floppy disk, battery operated M22 into a transportable, hard disk personal computer using AC power. The Olivetti Personal Computer M22 is a complete system. The minimum configuration contains: 256 K byte RAM, an 80-column by 25-row backlight LCD, a full 85-key professional keyboard, a 360 K byte minifloppy disk, the silicon disk, serial and parallel interfaces, a mouse interface, an industry standard expansion slot for the insertion of any half- or full-size expansion board offered on the market today, an additional slot for the insertion of a compact M22 board, the battery carrier and AC power supply. All this and a handsome carrying case for the computer, floppy disks, manuals, cables and so on. The Olivetti Personal Computer M22 can be connected to a full range of peripherals and both portable and desk-top printers. -	memory access time: 200 ns. The second CPU provides concurrent support for the built-in "personal windows" software and the silicon disk. *	256 KB NMOS RAM expandible to 1 MB (access time: 150 ns). *	mouse interface for Olivetti mouse (GIRD 2469). The built-in expansion slot allows the use of all industry standard boards (half and full-size). *	modem coupler (300 bps, half/full duplex, originated/answer) (MC10). *	10-NET attachment kit. 10-NET is a homogeneous PC LAN which includes among other features: multiple printer/ file servers, file/record locking, printer spooling, multiple security levels, job submission and utilities (i.e. 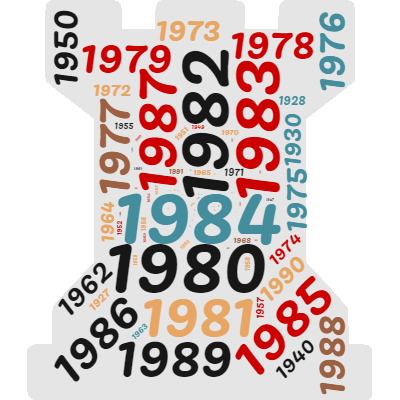 Electronic Mail, Agenda, etc.) (LAN 2486). The silicon disk provides hardware emulation of a 5.25in FDU using a protected region of dynamic RAM. Can be configured as drive A: or B. The size of the silicon disk may be set to 63 K, 126 K, 180 K, 360 K or OFF (disabled). *	10 MB 3.5in integrated Winchester hard disk unit (HDS 2210). *	LED indicators for the keys: "CAPS LOCK", "SCROLL LOCK", "NUM LOCK"
-	automatic adaptation to available mains (Universal). Included in basic configuration for comfortable portability of the system. Besides the M22, it can be used to carry for example floppies, manuals, etc. Olivetti offers a wide range of printers tailored to satisfy different users' needs. Either portable or desk-top printers are available. Type: daisy wheel or dot matrix. Speed: 25 to 220 cps. *	serial (RS 232 C). *	system on: 10 = 40°C. *	system off: 5 = 45°C. *	system off: 5 = 95% (non condensing). 10-NET is a trademark of FOX Research Inc.
MS-DOS, GW-BASIC, MS-FORTRAN, MS-PASCAL, MS-C are trademarks of Microsoft inc.